I started working on a few Christmas Quilts which will end up being rag quilts. I love snuggling under rag quilts. They are so warm. I found that I can relax more making rag quilts as well. Perfect cuts are not required. I can cut out a large quilt in a 1 or two hours. All it requires is a sharp rotary cutter. If you are dedicated, you can easily complete these in a weekend. I start with my purchased flannel and then I bring the two folded cut ends of the fabric together. This gives me four layers of fabric. I then fold this over to make eight layers of fabric. 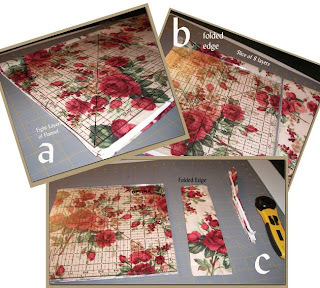 (image a) I lay my 9.5" square over this and cut a strip to match the length (image b). Then I cut off the ends and move on to the next set. I know this creates some larger scraps. I try to cut one side close and leave the other side larger(image c). This gives me larger strips to sew together for some quick crafts. Before you know it, you have a huge stack of cut squares. I pretty much do the same with my batting. Although I usually use leftover batting cut off from quilts. I try to make them 8.5" square. If I only have 7.5" square, I use that too. I sit watching my favorite program and quickly layer the squares and batting into sandwiches. Next thing you know, I have a large stack of sandwiches ready for assembly sewing. I assembly sew one center line on each square and snip each one apart. Repeat the process for the second line in the x on the square. Next stop, I'll be doing the quilt assembly and snipping the edges over the weekend. 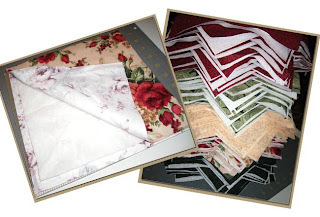 Before you know it, you could have 100 squares ready to make 6 x 8 block quilts. 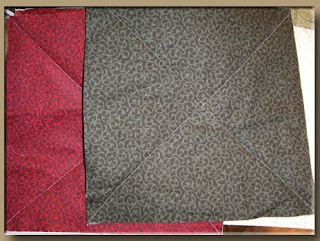 Using the 9.5" square and 1/2 inch seam, this makes two quick 51 by 68 quilts. 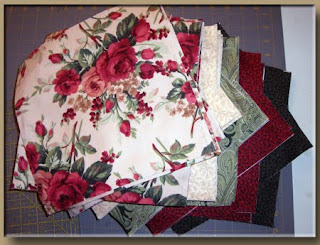 Great lap quilt gifts to give. Beyond the fabric cutting, we've just been enjoying little day trips here and there while we are on vacation. Not only DH and I but the dogs as well. Nothing says relaxing more than two lazy dogs. 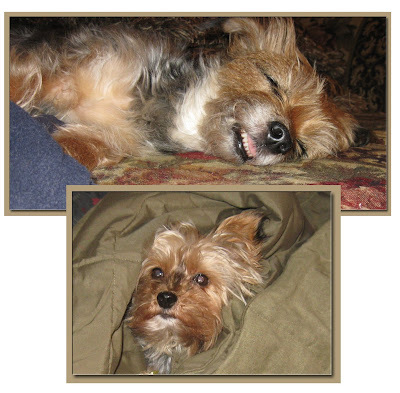 One usually sleeps wherever she can and totally crashes and the other needs to be buried in a blanket. We always need to be careful where we sit with this little one. We have a crasher and a snuggler, too! In fact, they both sleep under a blanket at bedtime. Only problem is if one of them gets up in the night to stretch or scratch I have to wake up enough to cover them back up! What we do for our babies! I really enjoyed your post on your quilt process and am looking forward to the explanation and pics of the finish. I have four to do for Christmas and at least two of them could be done this way! Bear is a snuggler too - he's an under the covers dog and competes for bed space with an under covers and one over covers cat ... not much room left for me!